If Utah leads the nation in Chinese language education with more public immersion programs than any other state, Washington County is the apotheosis. Washington County School District – situated hundreds of miles south of the state’s bustling population center of Salt Lake – has five Chinese immersion programs, more than any other district. It’s a feat that the district has managed, despite its relative isolation. There isn’t a ready pool of Chinese immigrants or university-trained Mandarin speakers from which to draw upon to staff the program. Instead, the district relies on guest teachers furnished through the Hanban, a division of the Ministry of Education in China. That, and good-old-fashioned hospitality. To welcome the teachers, and help them settle into their new surroundings, Marybeth Fuller, the district’s dual immersion coordinator created a guidebook. More than a mere pamphlet or list of helpful hints, the book contains a brief historical sketch describing how “Dixie” got its name, the area’s ancient Indian roots and influence of early pioneers. 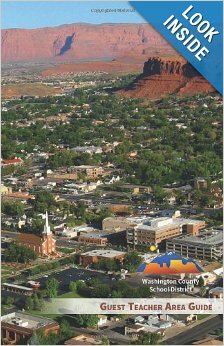 It touches on Utah’s economy and culture and spotlights popular destinations: natural wonders in National Parks, Mormon temples, and the shuttle bus to Las Vegas. It also contains practical living tips, such as directions to area hospitals and how-to’s for obtaining a driver’s license, auto insurance and for buying or leasing a car. Visitors to Utah this time of year probably think of snow-capped mountains, said Fuller. Nearly 80 percent of the state’s population lives in the mountainous northern part of the state known as the Wasatch Front. “You’re going to pack differently and bring different stuff if you’re coming to southern Utah,” she said. Fuller makes the guide available to guest teachers free of charge, but published it on Amazon.com for ease of access. It’s formatted for downloading on a smart phone or tablet, such as the iPad. Hard copies can be purchased for $2.71. This entry was posted in Uncategorized and tagged Chinese immersion, Mormon, Utah, Washington County School District on December 10, 2013 by diparents.